Once upon a time there were three toucans named Paco, Paz, and Pepe. 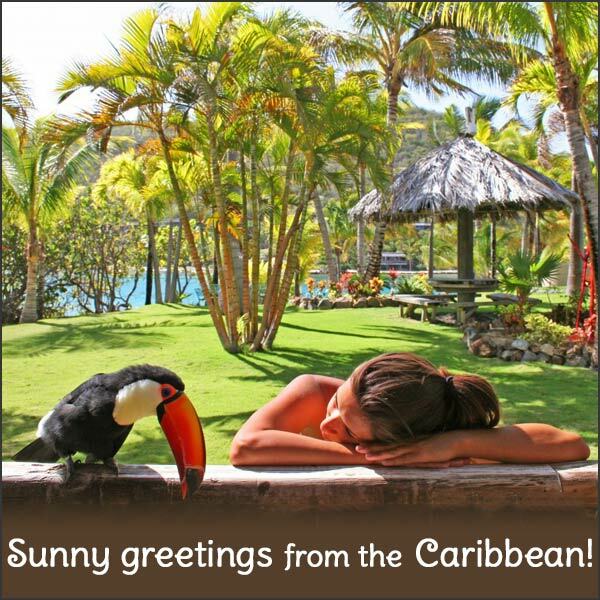 They lived on a little island in the Caribbean with their best friend, the Toucan Lady. They were a happy flock, living together side by side, enjoying their monkey-see, monkey-do lifestyle: when Paz would go to eat, so would Pepe and Paco; when Paco started his bath, the other two followed suit. They were the Three-Can Musketeers, all for one and one for all. Life was good. But then, as the days grew longer and Winter turned to Spring, an invisible, evil monster called Hormones cloaked itself upon the Toucan House, intoxicating the sweet little Three-Cans and driving them crazy. Suddenly, all Paz did was “croak-croak-croak” and all Pepe did was bounce around in a tizzy trying to give Paz all of his food through their shared wall. The Toucan Lady was sad that Paz and Pepe were frustrated. What was she to do? The Toucan Lady decided that it was time for Paz and Pepe to meet: face to face, beak to beak. After they showed her that they could play together nicely, the wall between them came down. Paz and Pepe bounced with joy to finally be together. Paco was happy too because now, not only did he share a wall with Paz, he also got to have Pepe as his new neighbor too. Life was good. But then, as Paz and Pepe started to work on their nest and came to the understanding that they were ready to start a family, the mind-altering Hormones Monster was back, convincing them that Paco was the enemy and would someday eat their babies. Paz and Pepe made it their mission to defend their house with forceful vigor against their frenemy, Paco Taco. Paco thought they were just being silly and playing a fun new game, so he would bring them toys and gleefully bang beaks with them. But Paz and Pepe were not playing and each day that passed, the Hormones Monster made them angrier and angrier. The Toucan Lady was sad that her flock was fighting. She knew she had to find a way to end the violence before somebody got hurt. First, the Toucan Lady tried to create a visual block by tying palm fronds on the wall in between Paz, Pepe, and Paco. She thought it would be nice if they could still see each other and remain a connected flock – just one with a bit more privacy for the couple in the group. But the Toucan Lady was wrong. The Three-Cans still fought through the wall wherever they could see each other – the Hormones Monster had made a war in Toucanland. But refusing to be defeated, the Toucan Lady set out again to find a solution to protect her flock from harm. This time, the Toucan Lady knew she needed to completely separate the two enclosures so that there could be peace again in her flock. She called the Fabric Mon and had him make a great big shade to cover the aviary wall. Once she put it up inside Paz and Pepe’s house, they could no longer see Paco and immediately a calm settled over Toucanland. Paz and Pepe are happy to have the wall because it helps them to feel secure – Paco is out of sight and out of mind. Paco wishes he could still see his friends, but the Toucan Lady makes sure she gives Paco even more attention than ever before – lots of outside playtime, extra toys and games, and visits into the Toucan Lady’s human house. This makes Paco happy. The Hormones Monster may have built a wall, but he could not destroy the spirit of Toucanland. Life is good and they all lived happily ever after. This entry was posted in Enclosures, General Info and tagged Adventures in Toucanland, bird, birds, BVI, Caribbean birds, exotic birds, exotic pets, hormones, island, Paco, Paz, Pepe, pet, pet bird, pet birds, pets, Saba Rock, spring hormones, Toco, Toco Toucan, Tocos, Toucan, toucan socializing, toucanland, toucans, tropical birds by Toucan Lady. Bookmark the permalink. I am so glad I found this sight. I had Tocos many years ago before they knew much about them. I am learning so much from your sight I didn’t know at the time. It is clear you are experts in the husbundry of these facination birds. Keep up the good work and thank you for caring so much about them. I apppreciate you following and your love of toucans, best to you!